1.Starfish is made of natural resin which is more strong. 2.Good decorations for wedding, craft project, holidays, home, etc. 3.NO CHIPS, NO CRACKS, NO BROKEN STARFISH. 100% Satisfaction. 4.Resin Starfish is more delicate and firm than natural starfish. 5.Each bag product includes 30 resin starfish(10 colors : White. Blue.Yellow. Green. Rose Red. Orange. Brown. Red and Light Blue) Each color for 3 Pcs. Mini starfish made of natural resin, resin starfish is more strong, solid design, and natural starfish similar, not like the smell of the seaside. Starfish craft color include 10 colors, each for 3 Pcs, giving a refreshing feeling, sea star diameter of 2.36 inches,sea star decoration can be placed anywhere in the decoration, easy to accommodate. Each bag product includes 30 bulk starfish, perfect decoration for home decor, weddings, ornaments or crafting, and bring you convenience. 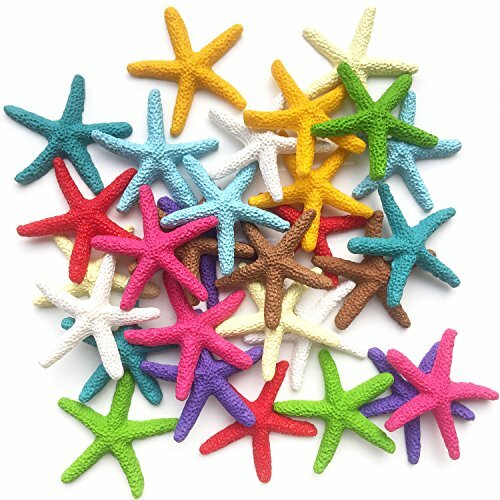 Small starfish for crafts shape simple, beautiful, simple color, its material environmental protection, no odor, used for decoration is the perfect choice. We guarantees Free Replacement or a Full Refund if you are not satisfied with the item, for any service, please contact our customer care team first, and let us make it right. If you have any questions about this product by Toosunny, contact us by completing and submitting the form below. If you are looking for a specif part number, please include it with your message.